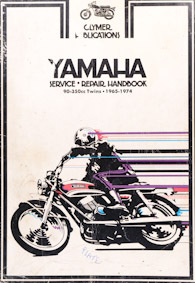 A couple of days ago I realised that we didn’t have one of the best service and repair manuals we have available in the manuals section. Now we do. The manual is a third party one from Clymer that works for a lot of different models. It covers Yamaha twins in the range 90cc to 350cc made from 1965 to 1974. It provides a better walkthrough than the manuals from Yamaha if you ask me. Check it out in the manuals section or below!